The Chrysler 300 is a full-size sedan and the flagship of the Chrysler brand. The 300 is a step above the usual full-size sedan, offering an upscale appearance inside and out. With its bold grille and large interior, you will be turning heads when you drive past in a 2018 Chrysler 300. And thanks to its impressive features, you will also love driving it. The 2018 Chrysler 300S offers an available appearance package to go with the standard performance upgrades. This package gives the 300S body-color highlights instead of the standard metal. It also adds signature LED daytime running lights and LED fog lights, replaces the side sills with a sculpted design, and adds a body-color rear spoiler. The 300C has its own unique appearance. The grille, door handles, and side mirrors get a platinum-chrome finish, and you also get a set of unique 20-inch aluminum wheels. The 2018 Chrysler 300 isn’t a luxury vehicle, but it comes close in many areas, like the interior quality. While the seats start off with premium cloth upholstery, get the right trim and you’ll have Nappa leather instead. You can also have sport seats on the 300S, which means they come with side bolsters and Alcantara suede that keep you from sliding around during high-speed turns. The 300C offers perforated leather with ventilation, and both it and the Limited have real wood accents. Though not as obvious as the appearance packages, something that will turn heads is the power under the 2018 Chrysler 300’s hood. The base engine is a 3.6-liter V-6, and thanks to its efficient design and eight-speed transmission, it can give you 30 highway mpg. It also offers a potent 292 horsepower (and up to 300 horsepower in the 300S), but if you want more, you can get it from the 5.7-liter V-8 upgrade. With this engine the 300 offers 363 horsepower. For better handling you can also get all-wheel drive and activate the available Sport Mode. 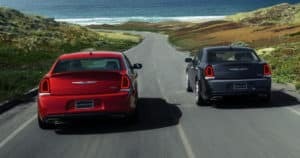 One other way the 2018 Chrysler 300 sets itself apart is with its technology. Every model features an 8.4-inch touch screen with Uconnect 4C, a system that includes Apple CarPlay, Android Auto, voice commands, Bluetooth streaming audio, and SiriusXM Radio. Get the version with navigation and you can also expect updating maps, SiriusXM Traffic, and Travel Link. You can also get a model with a 10-speaker audio system by BeatsAudio and 12 months of SiriusXM Guardian, a new feature that lets you remotely access some of your 300’s systems. The 2018 Chrysler 300 is an impressive full-size sedan with plenty of room in the passenger cabin and 16 cubic feet to spare in the trunk. With an upscale appearance, two powerful engine options, a high-tech infotainment system with available premium speakers, and an exterior that will turn heads, the 300 is a great option for any car buyer who wants a luxury experience without having to pay a luxury price.